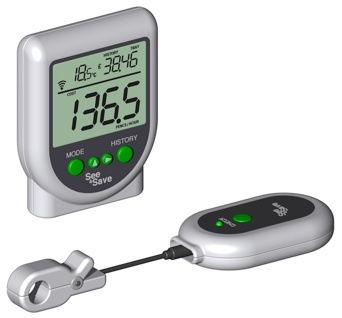 The See & Save Domestic Electricity Monitor (ESM 04) is a simple to use wireless electricity monitor with a similar level of features to that of the OWL Micro rather than the more complicated CM119 Owl Monitor or Efergy eLite. See & Save displays the current electricity usage as financial cost per hour, kW of power, or greenhouse gas emissions per hour. It also displays total usage history during the previous 24 hours, or during the last 7 days. 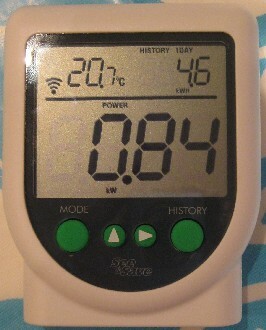 A thermometer is also included which is useful for knowing whether or not you need the heating turned on. Installation of See & Save is very easy thanks in part to its innovative clip on “easy fit” clamp. In all the other wireless electricity monitors we have tested previously, the clamp has to be wrapped all the way around a thick wire in very cramped conditions, and so it can often be quite fiddly. 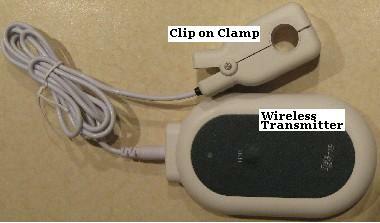 The “easy fit” clamp works just like a clothes peg – squeeze one end and the other end opens up to clip onto the cable. The clamp is then held to the cable very securely. With the clamp attached to the cable, and plugged into the battery powered wireless transmitter, you just have to put batteries into the receiver (display unit) and everything is ready. Pressing the link button on the transmitter at the same time as the link button on the receiver synchronises the units to one another very quickly, and the display unit starts to display energy consumption. Programming the settings on the display unit is very simple. Currency can be set as pounds, dollars, or euros; cost per unit (kWh) of electricity consumed can be set, and the rate of greenhouse gas emissions can also be changed. The only annoyance was that after completing this set up procedure, you have to wait 30 seconds for the display unit to revert to normal operation, rather than being able to just press a button to finish. See & Save is very easy to use. The display is large, easy to read, and well set out with the most important information shown in a very large font. 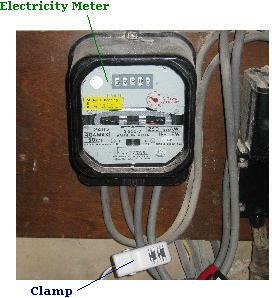 Current power usage is displayed to the nearest 10 Watts or 1 pence, and is refreshed far more quickly than is the case with other electricity monitors. This makes it better to use since if you turn a light or appliance on or off, the display almost instantly changes to show you the change in power consumption. Rather than just transmitting the current power consumption to the receiver at a fixed time interval e.g. every 6 to 60 seconds, See & Save has a more intelligent wireless link which enables near instant updates in consumption to be displayed without impacting on battery life. With other wireless monitors, you turn something on or off and then have to wait for a while for the change in power consumption to be displayed. The official See & Save Website is here. See & Save is a Socket & See product. The See & Save ESM 04 has only recently been launched in the UK. See & Save is a well designed and solidly built wireless electricity monitor which has a place in the market for those people that want a very simple to use, basic featured monitor to help them to see where their electricity (and money) is going.